HSEO will administer the Volkswagen Environmental Mitigation Trust funds and execute eligible environmental mitigation projects to reduce vehicle emissions in Hawaii. The “Volkswagen (VW) Settlement” is a series of legal settlements between various United States agencies, the State of California, and six VW-related entities – including VW, Audi, and Porsche – to resolve multiple criminal and civil enforcement cases against VW stemming from violations to the Clean Air Act (CAA) and efforts to conceal these violations. VW was charged with selling approximately 590,000 model year 2009 to 2016 2.0-liter and 3.0-liter diesel motor vehicles equipped with computer “defeat devices” which falsified emissions testing results and enabled these vehicles to emit air pollution significantly in excess of CAA limits. A primary emission of concern produced by the non-compliant vehicles, nitrogen oxides (NOx), is a significant health concern that contributes to the formation of smog and is linked to numerous respiratory- and cardiovascular-related health effects. For more information, visit the U.S. Environmental Protection Agency’s (EPA) Volkswagen Clean Air Act Civil Settlement website and the U.S. District Court’s Volkswagen Case website. Under the settlements, VW agreed to establish a $2.925 billion Environmental Mitigation Trust (Trust) for its beneficiaries to pursue alternative transportation projects intended to fully mitigate the total excess NOx emitted by the non-compliant VW vehicles. All 50 states, the District of Columbia, Puerto Rico, and federally recognized Indian tribes are eligible to become beneficiaries of the Trust and will be responsible for administering their respective Trust allocations, which are based upon the number of non-compliant vehicles sold in that jurisdiction. 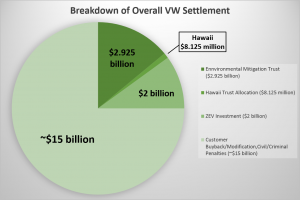 As an eligible beneficiary, the State of Hawaii has been allocated $8.125 million from the Trust based on the number of non-compliant VW vehicles sold in Hawaii. In addition to the Trust, VW will pay billions in penalties and customer vehicle buyback and modification programs. VW is required to invest $2 billion over the next 10 years in zero emission vehicle (ZEV) infrastructure and education projects across the United States through its Electrify America (ZEV Investment) initiative. 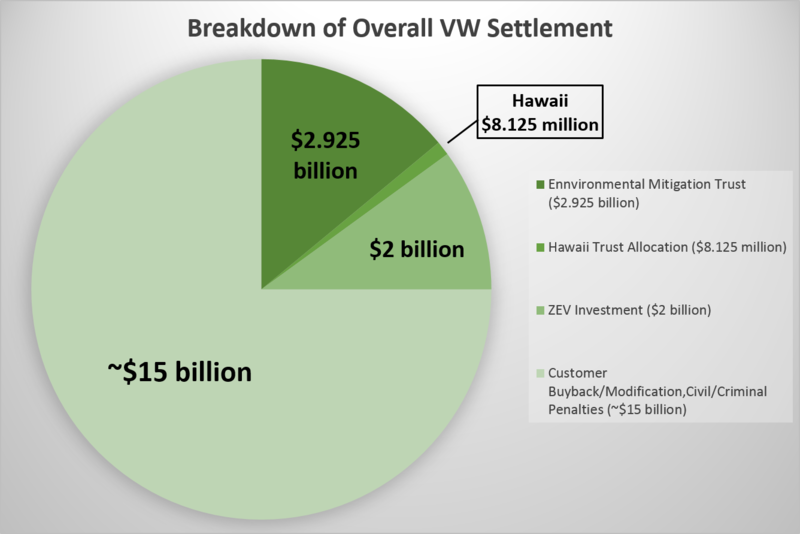 VW will consider submitted proposals and determine its ZEV Investment projects with oversight from the U.S. EPA which could possibly include Hawaii.